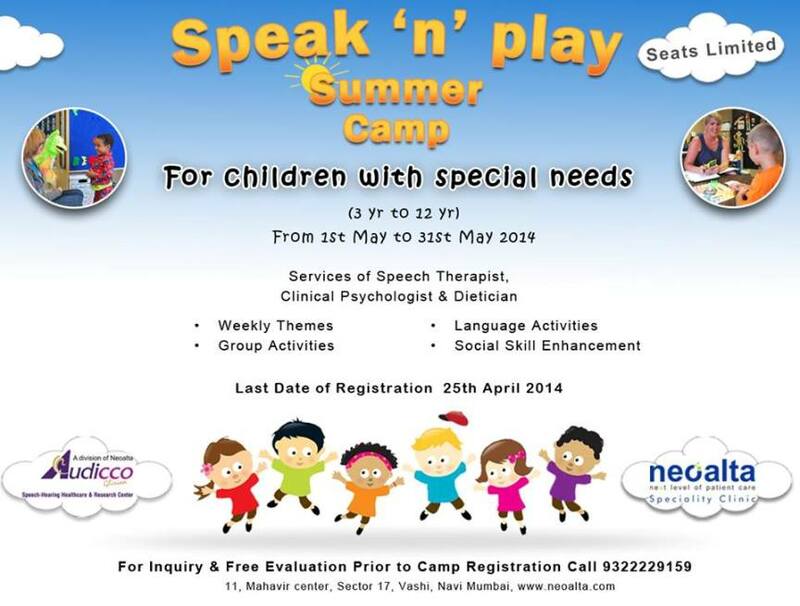 The Speak’ N’ Play Summer Speech Camp, is an intense speech and language based program by Audicco Gliriaa Speech Hearing Center. Team includes Speech- language therapist, clinical psychologist and dietitian. The summer camp is open to children ages 3–12 yrs and is focused on helping children improve socialization with their peers, and learn to self-regulate sensory information through building relationships and fun activities. Children are divided into small groups according to age and skill level and assigned a speech-language pathologist who organizes activities to help each child make progress toward set goals. Parents will have interactive session with Dietitian and clinical psychologist on their child’s specific requirements and at the same time they have the opportunity to meet with other parents who are raising children with a speech disorder. The parents share their experiences and discuss techniques that worked and didn’t work for their children. Seats are limited and our sessions fill up quickly. Call 9322229159 or Mail Info@audicco.com for FREE SCREENING to determine each child’s needs and their appropriateness for the camp. If your child is accepted, a non-refundable part fee of Rs 2000 will be required to hold the space which will be adjusted in camp fee..